SEYCHELLES – May 2017 – The Hilton Seychelles has launched a brand-new stay package for families in time for Eid holidays. The ‘I, Sea, You’ offer* is customised for Middle Eastern travellers looking for the perfect island getaway to enjoy as a family. With bookings open until April 2018, this new stay package is available across all three properties – Hilton Seychelles Labriz Resort & Spa, Hilton Seychelles Northolme Resort & Spa, and DoubleTree by Hilton Seychelles – Allamanda Resort & Spa. ‘I, Sea, You’ is created specially for families, especially those flying in from the Middle East, and includes free bookings for children**, spa treatments, a sunset cruise, Arabic pastries and shisha. At Hilton Seychelles Labriz families have the luxury of staying together in a secluded villa on the only resort on Silhouette Island, the third largest island in Seychelles. Each villa boasts private balconies, offering panoramic ocean views, as well as daybeds, sun loungers and dining tables. The interiors feature a subtle blend of Seychellois architecture and modern decor, with high ceilings, dormers and glass-panel French doors. Those booking their stay under the ‘I, Sea, You’ package can have children stay for free**. In addition to a dedicated babysitting service, the family-friendly resort features a range of kid-friendly activities for the little guests. The professionally supervised Kids’ Club at Hilton Seychelles Labriz is created for children aged four to 12 years, and includes programmes designed to create memorable island experiences for the children. There is plenty of activities for teens and adults as well. Scuba divers can take advantage of the five-star PADI-certified diving centre and explore the coral reefs lining the outer edges of Silhouette Island. Those holidaying under the ‘I, Sea, You’ package get a free sunset cruise for two, which showcases the western part of the island, including the 1km long sandy beach, plantation buildings and a spectacular sunset. If the sea is quiet enough, guests could see flying fish during the tour. Panoramic island views and authentic Creole flavours are key ingredients of vacationing at Hilton Seychelles resorts. Bringing a feeling of home at Hilton Seychelles Labriz are Lo Brizan Bar and cocktail bar Moonlight Payot, which serves shisha in a variety of flavours. Snorkelling, kayaking, fishing and a nature walk through the island’s jungle complete the authentic Silhouette experience. For a relaxing break from the activities, all three Hilton Seychelles resorts offer two complimentary 60-minute spa treatments at eforea spa, a stunning retreat located on a hillside, as part of this exclusive offer. Nestled between ancient rocks and a sprawling jungle, Eforea Spa has three distinctive treatment journeys, each encompassing a unique approach. Guests can choose from the Enhancement Journey, the technologically advanced Essentials Journey or the indulgent Escape Journey. Those looking for a romantic getaway or a kids-free zone on their vacation can opt for Hilton Seychelles Northolme. A hidden treasure, this resort on Mahe Island is surrounded by white-sand beaches, tropical gardens and crystal waters. 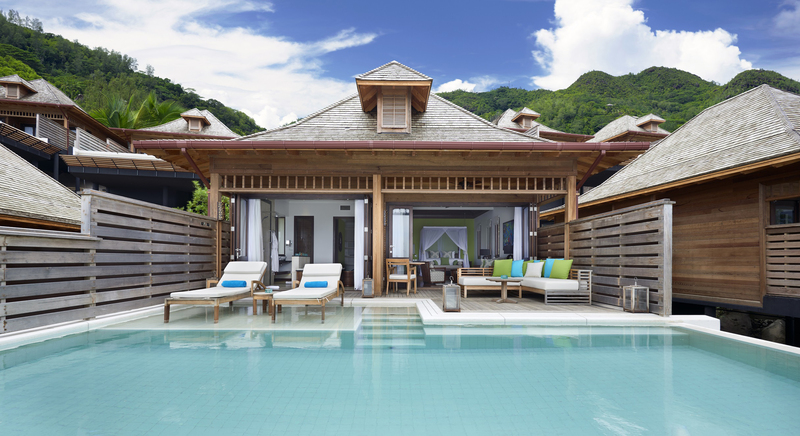 Perched on stilts, the villas at Hilton Seychelles Northolme provide gorgeous views and plenty of privacy. An infinity pool, oceanfront dining, a luxurious spa, and glass-bottom boat tours are highlights of this retreat in Beau Vallon Bay. For the adventurous, the resort can arrange a helicopter tour offering guests a luxurious aerial limo service between the inner and outer islands of Seychelles. Ocean View Bar welcomes guests to unwind after a long day of thrilling activities on the split-level decked balcony, with an exotic cocktail and some live music. As part of the new stay package, guests can also enjoy shisha with stunning views of the ocean coves. Located in Anse Forbans, DoubleTree by Hilton Seychelles – Allamanda Resort & Spa resort boasts a private beach surrounded by untouched lush tropical foliage. The modern four-star property also allows free** bookings for children under the ‘I, Sea, You’ package, so families can experience a luxurious holiday by the sea. All guests at DoubleTree by Hilton Seychelles – Allamanda Resort & Spa can enjoy views of the Indian Ocean from the balcony or while relaxing in their private whirlpool. Shisha will be served at the resort’s Ocean View Bar, the ideal setting to dine under the stars. Catering to the Middle Eastern traveller, all resorts will also have traditional Arabian pastries served to guests in the comfort of their rooms. *All rates are subject to hotel availability; rate does not include taxes, gratuities or other incidental charges; certain length of stay restrictions may apply. Early departure fee may apply. This offer may not be combined with any other discounts or offers. If you are not interested in making this reservation online, please call our Internet Customer Center at 1-800-774-1500 or click here for a complete list of Hilton Reservations Worldwide phone numbers. Please request plan code “PR40IS”. **Hotel Child Policy applicable. Children below the age of 6 years free. Children from 6 – 12 years enjoy a 50% reduction on the supplements. No further reductions apply on the above supplements. – Offer valid until September 30, 2017. – Hilton Seychelles Labriz Resort & Spa: Stay between 01 Jun 2017 and 18 Apr 2018. – Hilton Seychelles Northolme Resort & Spa: Stay between 14 Apr 2017 and 19 Apr 2018. – DoubleTree by Hilton Seychelles – Allamanda Resort & Spa: Stay between 14 Apr 2017 and 12 Apr 2018.